With their long life cycle, trees must have accurate mechanisms to perceive microbial invasion and elaborate signalling networks in order to activate the appropriate defense response through transcriptional reprogramming. Transcriptional activators and repressors participate in the tight regulation of the stress response, which is key to minimise the fitness costs associated with an activated response. With the availability of its whole genome sequence, ease of growth and clonal propagation, and routine transformation, poplar (Populus spp.) is considered a model tree species for genomics research and also a good system in forest pathology . Moreover, genomes of a cortege of associated microorganisms are being sequenced including a tree pathogen, Melampsora poplar rust. We pursued various approaches to identify poplar genes involved in the interaction with the biotrophic Melampsora rust pathogen. Recent transcriptome analyses from our lab have shown that the expression of genes encoding several transcription factors are up-regulated during infection by Melampsora rust. Similarly we have also shown that mitogen activated protein kinases (MAPKs) are associated with poplar disease resistance against Melampsora rust . New data obtained from various experimental approaches have directed our focus on two important families of transcription factors; the jasmonate ZIM-domain (JAZ) and Cys2/His2 zinc-finger protein (ZFP) families. We have identified a novel MAPK-interacting partner, PtiZFP1, which belongs to the C2H2 ZFP family of transcriptional EAR repressors.The JAZ family of transcriptional repressors were recently identified as key negative regulators of jasmonate (JA) responses.Transcript analyses show that some ZFP and JAZ members exhibit hormone-related expression profiles and up-regulation by rust infection. This up-regulation of JAZ and ZFP transcripts after rust infection strongly suggests that a hormonal response including JA is a key component of the poplar defence response against Melampsora. Late and sustained kinetics of PtiZFP1 and specificJAZ up-regulation suggest that the corresponding proteins may be required for late regulation of defense mechanisms. Several recent data have shownthat proteolytic cleavage of transcriptional repressors is a general mechanism used by plants to activate gene induction. This mechanism is now well documented for jasmonate signaling, which depends on proteasome-mediated degradation of the JAZ repressors [3, 4]. In the present work, we also obtain clear evidence that MAPKs promote degradation of PtiZFP1 through the 26S proteasome.Our work suggests that PtiZFP1 and JAZs are part of Melampsora specific hormone-related responses, and by correlation as putative transcriptional repressors, participate in the regulation of the transcriptional responses downstream of these stress hormones.We hypothesize that the observed gene induction play a negative feedback loop needed to replace PtiZFP1 and JAZ proteins that were degraded following through the 26S proteasome. Newly synthesized repressor proteins could contribute to defense attenuation and therefore prevent a runaway response. Based on our data, we propose a model (Figure 1) where two important families of transcription factors play a predominant role in poplar defense response to the biotrophic fungus Melampsora. The activation of poplar MAPKs would lead toPtiZFP1 degradation and as a result to transcriptional activation of defense-related genes. In parallel we also observed that several genes involved in the JA response (including JAZ) are induced following Melampsora infection. This model highlights the importance of the 26S proteasome in regulating protein pools of transcriptional repressor. For future studies we intend to uncover which cis elements and target genes are recognized by PtiZFP1 and perform functional approaches to uncover JAZ interacting proteins in poplar. Proposed model of PtiZFP1 function in the plant defense response. During normal conditions, direct transcriptional repressors such as PtiZFP1 inhibit the expression of stress-related genes. 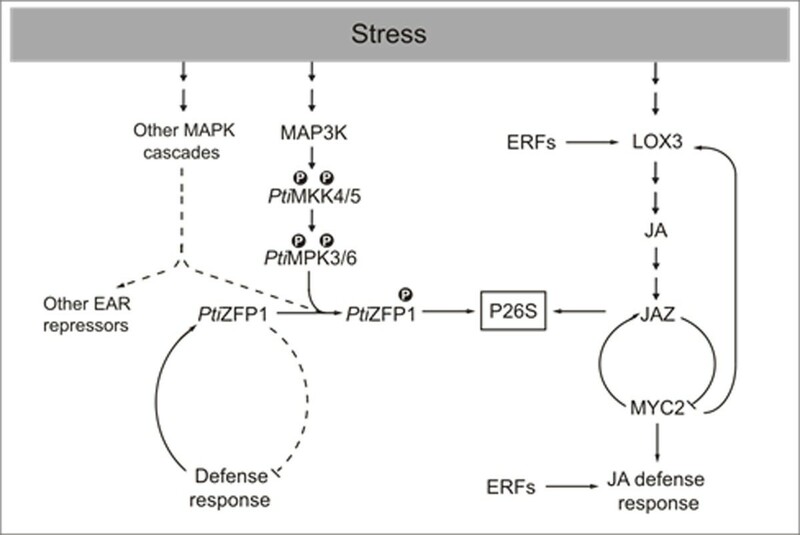 Following stress perception, a MAPK signaling cascade is activated leading to phosphorylation of PtiZFP1. Phosphorylation targets PtiZFP1 for degradation via the 26S proteasome (P26S), thus relieving repression of defense genes. Defense signaling in turn activates PtiZFP1 gene transcription in order to replenish normal PtiZFP1 protein levels and complete a regulatory cycle necessary to attenuate the defense response. A similar regulatory cycle exists for jasmonic acid (JA) signaling. JA biosynthesis is induced by stress which then promotes proteasome-mediated degradation of JAZ proteins. These indirect transcriptional repressors sequester the bHLH MYC2, thus inhibiting expression of defense genes under non-stressed conditions. Upon release, MYC2 ensures both positive and negative feedback loops by activating LOX3 and JAZ genes respectively. Confirmed and hypothetical pathways are presented in bold and dashed lines respectively.